As you read and study what has been written here, do not just blindly accept it. Please check the Scriptures and ask the Holy Spirit to reveal to you His truth. The Scriptures quoted here are from the King James' version with the words of Jesus in red. This is an essay on my view of the church. It also includes what I sense the Lord is showing me about His Church. But first it is necessary for me to define some of the terms I will use. "Church" (with a capital "C") is that which Jesus declared in Matthew 16:18 when He said "I will build My Church; and the gates of hell shall not prevail against it." It includes all who are "Born again believers." "church" (with a lower case "c") is that which man has built. The multi-thousands of denominational and non-denominational sects so prevalent in society today. "Radical Christians" are those who are "totally sold out" to Jesus, daily dying to self, and seriously in love with the Lord. "Nominal Christians" are those who attend services but seldom if ever read the Bible, spend time in prayer or talk with others about the Lord. "Called out ones" are those who have answered God's call to a closer walk with Him. I also see people regularly gathering together to worship the Lord in unity. These will be people who are "Radical Christians", madly in love with God and totally sold out to Jesus. His "Called out ones." They will be from all of the sects presently in any given area plus many who have no connection to them. Their only desire will be to see, and have, more of the Holy Spirit and less of themselves. It is when we gather in unity to worship the Lord that He shows up. That will be a day when there will be only "The Church" at "my town." I define that as all of the believers in the "my town" area united as one body of people, fully joined to one another, without barriers of church background, acting together in an expression of the life of Christ to the community around them. I also see that as a time when the presence of God is so powerfully felt that even those who are just passing through will sense and know He is real. When that day will be I have no clue, but it is coming. Man blended pagan ideas into the church which produced a counterfeit. This counterfeit has been taken farther from the original plan by incorporating into itself, a worldly business model. The local, and trans-local, church leadership has become a "CEO" and "board of directors" making it a democratic organization rather than the theocracy God intended. This has blended the wheat and the tares into a single unit - the church of today. In most cases it is very difficult to distinguish the church from the world. Not only has the church adopted the world's pattern of leadership but also its lifestyle as well. The statistics for divorce, adultery, juvenile delinquency and many other family problems within the church are very similar to that of the world. While there are reports of many people being "saved" in evangelistic crusades we see very little evidence that lives are actually being "changed" by the experience. Sure, there are a few reports of individuals who have been radically transformed from a sinful life into on-fire preachers of the gospel of Jesus Christ but these seem to be the exception. Based upon the large numbers of people reported to have been converted in these evangelistic crusades it should be expected that church growth would be much more than it is. You would also expect the church to have fewer spots and wrinkles than is presently seen. 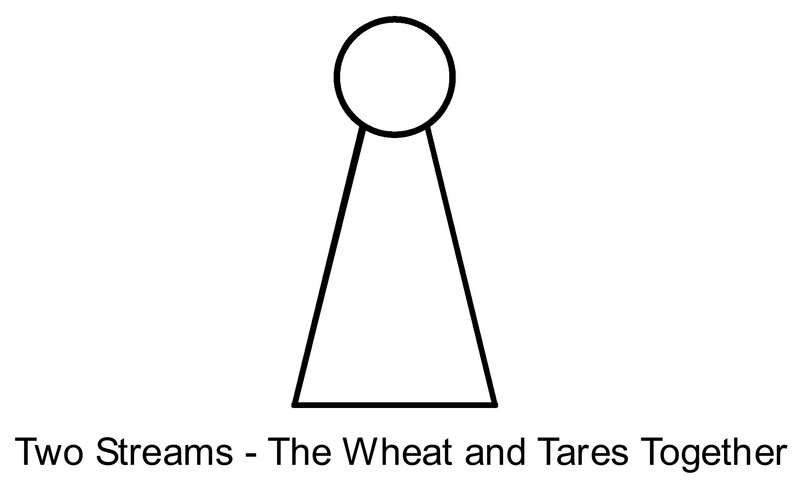 The first of the two drawings show the wheat and tares so intermingled that they appear as a single image. These verses of Scripture have been interpreted in many different ways by a large number of people. Quite a few have felt it is a call for God's people to "come out" of the institutional church because of what they see as gross error in those organizations. Others have strongly disagreed with that premise. I sense truth to lie somewhere in between these two extreme views. God has allowed man to form the many thousands of divisions within the body of Christ whereby there exists several churches within a community. This is contrary to the plan set in place during the first century where there was a single Church in each locality. 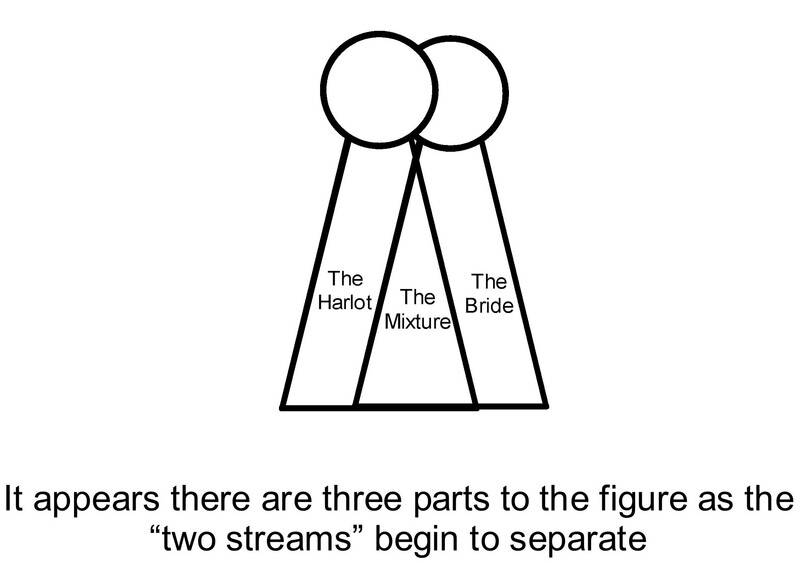 This separation or "coming out of her" is more spiritual than physical, however for many it is also an actual physical separation. Let me be very clear in stating that I don't see the church as all bad or evil. There is much that is right. Most all involved are operating with honorable intentions, trying to live by man's interpretations of Scripture. But the fact remains that today's church is a blend containing both the "clean and unclean" and is not the Church Paul says in Ephesians 5:27 that Jesus is expecting to present to Himself. (That he might present it to himself a glorious church, not having spot, or wrinkle, or any such thing; but that it should be holy and without blemish). A clarification needs to be made about who is the Church. All who are "born again believers" are the Church. And it makes no difference where they are or which local church body they fellowship with. Most people don't realize it because they think of the Church only in terms of the individual congregation they attend as "the Church." Unfortunately, many in the church today are not actually part of the Church. These are people who believe that because they have joined an organization they call church, or were raised in the church, or are not of Jewish decent, or they live in a "Christian nation" automatically makes them Christians. George Barna, a researcher of church trends, made this statement in his 2000 "State of the Church" report: "In a typical week, 41% of the adults attending Christian churches are not born again." He also stated: "Like the churches of Laodicea and Sardis, described in the Bible as distasteful to God because of their complacency and spiritual deadness, too many Christians and churches in America have traded in spiritual passion for empty rituals, clever methods and mindless practices." Many in the institutional church are a part of the Church but aren't aware of their position. They don't fully understand what the "body of Christ" really is and that they are a part of it. They tend to think only in terms of the local body they associate with. Often there are Christians who are somewhat radical within a local church congregation. They often recognize they are different than others in their congregation. The "empty rituals, clever methods, and mindless practices" just don't satisfy their hunger for more of the Holy Spirit. They are between the "called out ones' and the "Radical Christians." These usually are people very involved in the activities of their church. They have a sense of doing "good things" but not really that which the Holy Spirit is asking of them and frequently suffer guilt feelings about it. These are people who desire to use the ministry gifts God has placed in them. Often however, their church leadership either forbids or discourages them from using these ministry gifts. Nominal Christians in the church will often see these people as a threat to the good, but non-biblical thinking, of the group. Sometimes this results in their being asked to leave the group. I believe God still intends for there to be only one Church in any town or local area. Paul has much to say about the body of Christ in 1 Corinthians, Chapter 12. He says we are all baptized into one body in verse 13 of that chapter. There are however, small pockets of "radical Christians," the "called out ones," scattered both in and out of the church but few of these individuals are aware of the others. Several years ago the Lord showed me there were small groups, of two or three people, scattered all over the world who were His "called out ones." Most of these had no idea there were others like them even in the same town or among those they attended church with. I was shown this was a cloth of these small groups that were invisibly connected to each other with a thin strong thread. That thread is Jesus. This cloth has a very lacy appearance at this time but will eventually become a solid fabric with no gaps between groups. God sees a "whole cloth" but we see only a very open weave lacy fabric. I have attempted to crudely re-create the image given me in this drawing. Each green dot represents an individual or a group of individuals. The black lines represent Jesus as the the invisible thread connecting the individuals to one another. The connecting thread is very tiny but extremely strong. As more individuals become aware of others, the number of green dots will increase and there will be additional connecting lines between the dots. As individual groups become aware of others and begin to interact with one another, the connecting lines will grow wider increasing the strength of that thread. These are people I believe God is using to bring His Kingdom into being on earth. The Difference between a Kingdom and a Democracy. This requires a drastic change in our thinking. We who have been raised in a democracy have no real understanding of the huge difference between a kingdom and a democracy. We have been taught that in our democracy, the people rule through an elected leader, a president or prime minister. All too often however, a small minority of the people govern through their money which "buys influence" to convince the elected leader to establish rules in their favor. In a kingdom, the ruler is a king who was not elected but born into the position. A king owns all that is in his kingdom including the people. A president or prime minister owns very little in the country he supervises. Our fully understanding this difference is vital to seeing His Kingdom on earth. God intended that His Kingdom would be established on earth as it is in heaven. If God had intended "democracy on earth as it is in heaven" He would have stated it that way in Matthew 6:10. Thy kingdom come. Thy will be done in earth, as it is in heaven. We are the ones He has chosen to use to accomplish that. God gave Adam dominion over the earth and all that it contains when He placed him in the Garden of Eden. We, who have been saved, still have that authority because it was restored to us by the blood of Jesus. That restoration transferred our citizenship from the kingdom of darkness to the Kingdom of Heaven. We live on earth but are Ambassadors for the Kingdom of heaven. What is our privilege and responsibility as an ambassador of the Kingdom of heaven? This is spelled out for us in the 20th verse of 2 Corinthians. Now then we are ambassadors for Christ, as though God did beseech you by us: we pray you in Christ's stead, be ye reconciled to God. (2 Corinthians 5:20) That duty is more clearly defined for us in the Message Bible translation which states it this way: "We're Christ's representatives. God uses us to persuade men and women to drop their differences and enter into God's work of making things right between them. We're speaking for Christ himself now: Become friends with God; he's already a friend with you." We are to know His will and speak it into existence here on earth by speaking His Word. He made us in His image therefore we are like Him. God spoke and it became (See Chapter One of Genesis). He created every thing by merely speaking it into existence. As His ambassadors, we also have the ability to speak His Word and bring it into existence here on earth. Doing so will bring the Kingdom of God down to earth. The church in my Locale. The visible church in my small community currently consists of several separate congregations. They include names of well known denominations as well as some groups few have ever hard about. To date I have found nine listed in the local telephone directory. I suspect there may be more that I am not yet aware of. While I am not that familiar with any of these individual congregations, I do believe the church in this area is very similar to that of the rest of the country. After having attended services at several of these, my sense is they are not that much different from churches nation-wide. Additionally, conversations with individuals in the community indicate to me these assumptions are correct. I firmly believe God has placed a number of people in the community where I live for the purpose of bringing His glory down. I am currently aware of nine people who have moved here with no earthly reason they can explain. They each felt drawn here but have no real reason why they should have done so. I feel there are others that I don't yet know about that were also "moved here" by the spirit of God. Among this group of nine is one additional individual who has lived here most of his life making a total of ten individuals. These ten individuals are now beginning to gather to bring the Kingdom of God into being in this community. It is only when we individually, and corporately, clearly understand what a kingdom is and how it functions, that we then can comprehend the meaning of the Kingdom of God on earth. The Church in my small community is mostly invisible at this time. There are ten of us in one group that know about one another. We gather each Saturday evening for a minimum of one hour, praying in the spirit, seeking God's Kingdom. We are asking Him only for the expression of His Kingdom to be manifested here. Personal desires and needs are not thought about nor mentioned during this prayer time. Several others who have become aware of what we are doing have expressed an interest in joining us. We have also learned there are groups in other communities that are doing this same thing. There is another group of about fifteen individuals who are meeting on Friday evenings with a similar focus. This then makes upwards of twenty-five that we know about who are seeking God's Kingdom to be manifested here. We don't know how many other individuals there are in the area that we have no knowledge of. We are likely a very small portion of the body of Christ in this small community who are daily desiring the Kingdom of God to be expressed in ourselves and in the local area. Before the Kingdom of God is visibly seen in any place, it must become real to individual believers in that area. We must learn how the government of God is structured. Kingdom rule is much different than the democracy we have been taught to live in. This is especially true in today's society where many seem to think obeying the law of the land is something you need to do only when you want to. In a kingdom the word of the king is law and can not be changed by anyone. Obeying the word of the king is mandatory. Disobeying the word of the king is not tolerated. There is a price that must be paid. This applies to the Kingdom of God as well as to worldly kingdoms. When we accepted the free offer of salvation it came with a change of citizenship. Where we had been under satan's rule we are now citizens of the government of Almighty God. He has bought us with the blood of His Son Jesus. We are now part of His domain even though we still reside on earth. Our residence may be earth but our citizenship is in heaven. As a citizen of heaven it is necessary for us to learn how God's government operates so that we will understand what is required of us. His commands are set forth in His Word, the Bible. It is our "owners manual" complete with all the instructions we need to live in accordance with the laws of our King. This transfer of citizenship from the kingdom of darkness into the kingdom of God brings many blessings. One of those blessings is our appointment as His Ambassador to earth. We now have the privilege and responsibility to represent Him and His government here on earth. What we speak and how we act must be in accordance with His will and not our own. Our only focus now should be to bring His government into existence in our part of the earth. As we become better acquainted with our king and learn more about His government our thoughts will change from those of a democracy to that of a kingdom. This, combined with prayers for the Kingdom of God to be manifested in our lives, will begin to bring His kingdom down to earth wherever we are. When others join us in this endeavor the effect will be magnified and cover a larger geographical area. What Will Bring God's Kingdom to Earth? Becoming "born again" only opens the door to the Kingdom of God. Accepting Jesus as our savior is just the first step, even though it is an extremely important one. We must enter into the kingdom by actually having a personal relationship with the King to know who He is and what His will is. Along with these two things we should gather with other like-minded believers who will join us in this prayer focus. There are two things we must remember. The first is that we can do nothing of eternal worth by ourselves. The second thing is that God will work only through our prayers. While He is capable of establishing His will on earth without our help, He has chosen to do it only through us. As we seek His kingdom, develop a personal relationship with Him and enter into prayer, He will begin to change us into proper citizens of the Kingdom of God. We will begin to develop a "kingdom mentality," which will make us better ambassadors for our King. As we become proper ambassadors of the Kingdom of God it will change the atmosphere around us bringing heaven down to earth. We are to know His will and speak it into existence here on earth by speaking His Word. God created the earth and all that is in it by merely speaking it into existence. As His ambassadors, we also have the ability to speak His Word and bring it into existence here on earth. Doing so will bring the Kingdom of God down to earth. Lord, help us to speak only that which your word declares. Let not our lips utter the logical thoughts based upon what our natural eyes behold but rather that which our spiritual eyes and ears have seen and heard. May the Lord Jesus daily add those whom He will to His Church. And may He also answer our constant prayer for His Kingdom on earth as it is in heaven.